Florianopolis (Portuguese: Florianópolis) is the capital of the Brazilian state of Santa Catarina. Half of the city is on the mainland of Brazil while the other half is on the Santa Catarina Island. It has some of Brazil's most beautiful beaches. It is formed by an ocean island of 436 km² (54 km by 18 km) and a small peninsula on the mainland, with 1210 km². It is situated in southern Brazil between the parallels 27 20' and 27 51' latitude south and between the meridians 48 20' and 48 35' longitude west. Three bridges link the island to the continent, but presently, Hercílio Luz Bridge, a landmark of the city, is closed for repairs. It is possible it will open in the future for pedestrians and cyclists. Recently, Florianopolis has become one of the most popular destinations in Brazil for people who are looking for superb beaches, beautiful scenery, interesting culture and friendly people. It has also experienced a real estate boom, with Brazilians looking for a better quality of life away from the chaos of the big cities, especially from the states of São Paulo and Rio Grande do Sul. The city proper currently has an estimated population of 420,000 people. The Greater Florianopolis Metro area is home to about 1 million people. The northern beach resorts Jurerê, Daniela, Canasvieiras, Brava and Ingleses get very busy during the summer and there are plenty of hotels, restaurants and other conveniences for the tourist. Eastern beaches, like Joaquina, Mole and Moçambique are among the best surfing beaches and popular with young people. Beaches heading south include Campeche, Armação and Morro das Pedras, which are all very beautiful and also good for surfing. 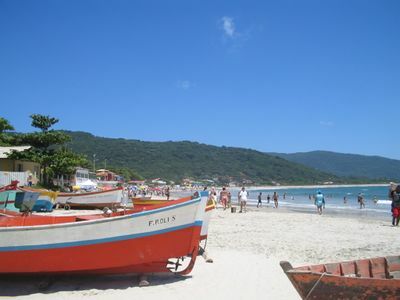 Isolated and unspoiled beaches, like Lagoinha do Leste and Naufragados, can be found at the southern end of the island and can only be reached by trail. Lagoa da Conceição is a famous natural attraction, and the centerpiece of the island; it is relatively shallow, with high winds making it a world-class location for windsurfing. Peri Lagoon is quieter on the other hand, and great for nature walks. The city of Florianopolis is quite modern, with large shopping malls, chain and high-end restaurants and many glamorous bars and nightclubs. The highway system serving the city is very good. Hercílio Luz International Airport (IATA: FLN) - Av. Diomício Freitas, 3393. +55 48 3331-4000 (fax:( +55 48) 3331-4111). 12 km from the city center. Connected to the city by local bus lines or taxi. The Brazilian airline "TAM"  provides international and domestic services to Florianopolis. Flights are available from JFK International(NY), Miami, Madrid, London, Frankfurt, Milan and main cities in South America. Most of the flights require a connection in Sao Paulo. Airlines Gol , Azul  and Avianca (formerly Oceanair)  operates domestic flights to the city. Gol also operates destinations in South America, like Buenos Aires, Montevideo and Santiago. in the summer months (December thru March) several daily charter flights arrive from Argentina & Chile. Aerolineas Argentinas usually adds seasonal daily regular flights non-stop to Buenos Aires. Terminal Rita Maria, the name of the Central Bus Station, is located at 1104 Paulo Fontes Ave., in the city center +55 48 3222.2260. It links Florianopolis City to the main Brazilian cities and to most of the cities in Santa Catarina state. The main bus companies operating in Florianopolis are Catarinense , Reunidas , Santo Anjo  and Eucatur . You can get to Florianopolis from Foz do Iguaçu for R$115 to R$150. The night trip takes around 16h. From the city center, dozens of buses go to all the beaches on the island. The bus system has drawbacks since transfers are necessary at regional terminals, and some trips can take up to several hours if there are long layovers. The cost is 3.10R each way, transfers are free at the stations, and it takes about 35-60 minutes on average to get from the city to the beaches. Some trips may take considerably longer. Some wait times can be several hours if you are not on a common bus route, so be sure to inquire about that with your hostel or hotel staff. Additionally, there is an air-conditioned yellow bus (Linhas Executivas) that goes directly downtown from the main beaches for 7.00R. A car is recommended to explore all the beaches and interesting spots. There are car rentals on the island and at the airport. Renting can be expensive as well (120R/day with A/C), however it is worthwhile as it makes exploring this beautiful island more efficient and pleasurable. During the high season traffic can be intense, and it could easily take one 2 hours to get to the beach from the city center. Catedral Metropolitana - One of the most beautiful buildings in the city, located at Praça XV de Novembro. Municipal Market - Formerly used as the city market place, this market on Largo da Alfândega still holds some interesting sights. Hercílio Luz Bridge - The postcard symbol of the city, inaugurated in 1926 linking the island to the mainland. Lagoa da Conceição - A large beautiful lake in the center of the island. Ribeirão da Ilha - 36 kilometers from the center, this old district of Florianopolis is a testament to Azorean immigration. Its historic center, in Frequesia, has a plaza which contains the Igreja Nossa Senhora da Lapa do Ribeirão (church), and the Ethnological Museam which houses documents and relics from the region's history. Teatro Álvaro de Carvalho, rua Marechal Guilherme, 26. (near the Catedral Metropolitana), tel. +55 48 3028-8070/3028-8071. In the center of the city, the Municipal Theater is an example of 1870's local architecture. Teatro Ademir Rosa (Teatro do CIC), Av. Irineu Bornhausen, 5600, tel. +55 48 3953-2300. Velha Figueira - This 100+ year-old tree in Praça XV de Novembro is honored in the official municipal hymn of Florianopolis. Forts - Constructed as early as 1739, the forts served to protect the city from possible Spanish attacks. One of the best bars and nightclubs in Brazil is Confraria das Artes in Lagoa da Conceição. It attracts the jet set crowd from all over the world. Shopping Beiramar, Rua Bocaiúva (Centro, parallel with Av. Rubens de Arruda Ramos, better known as Av. Beiramar Norte), tel. +55 48 3223-6425, . Around 200 shops. Shopping Itaguaçu, Rua Geroncio Thives, 1079 - Barreiros, tel. 0800 480055, . The oldest shopping mall in the state, opened in 1982. In neighboring São José, within ten minutes of the city center. It currently has 180 shops and 7 movie screens. Floripa Shopping, SC 401, tel. +55 48 3331-1000, . New shopping center with 160 shops and 8 movie screens. Iguatemi Florianópolis, Av. Beiramar, at the corner with Av. Madre Benvenuta, tel. +55 48 3231 4900 - Bairro Santa Mônica, . 200 shops and 7 movie screens. In fact, this cinema has one of the largest screens in Brazil. All are modern and stadium seating style. Seafood - This coastal city is known widely for its fresh seafood. Portuguese Food - The city had been colonized by the "cultura açoriana". Their food is delicious. Italian Food - Macarronada Italiana is the main spot. Great. But there are many other good choices as well. Downtown- There are great "per kilo" buffets with amazing food, salads, and fruit. You can get a full meal with a fresh juice for under $6. It's good for the budget traveler and to get a sense of where many locals get a quick bite. Bar do Arante, Praia do Pântano, in the south of the island. Tel: +55 48 3237-7022. Interesting restaurant where the custom is for customers to hang slips of paper on the wall to mark their passage. The custom comes from pre-electricity days when people would use the slips to let friends know what part of the beach to find them in. Specializing in seafood at moderate prices. Try the Tainha Grelhada. Mein Haus Churrascaria, Rua Papa Joao XXII, 25 - Campinas - São José, tel. +55 48 3241-4739. It is further across the bridge but worth the effort. The restaurant offers a nice cheap a la carte barbecue with free garlic bread and salad . Pier 54, Av. Beira mar Norte, (under the Hercílio Luz bridge) - Centro, tel. +55 48 3225-3138 / +55 48 3225-2419. This restaurant serves local cuisine from 7 PM. Pier 54's cellar contains over 250 labels of different wines and champagnes. The restaurant offers a wide range of healthy dishes, made from ingredients local to the region. Toca da Garoupa, Rua Alves Brito, 178 - Centro, tel. +55 48 3223-1220. This restaurant offers its guests the regional cuisine of Floianopolis. While the seafood menu may be exceptional, the restaurant's decor and history are sure to please customers as well. Bistrô Isadora Duncan, Rodovia Jornalista Manuel de Menezes, 2658 - Barra da Lagoa, tel. +55 48 3232-7210, 9980-4428, . Named after a famous ballerina, this bistro is a great romantic spot for two. It only has 5 tables and some veranda space. The bistro offers a wide variety of cuisine, ranging from leafy green salads to filet mignon. Alchohol is also served on this cozy, beach front bistro. Ponta das Caranhas, Estrada da Barra da Lagoa, 2377 - Barra da Lagoa, tel. +55 48 3232-3076, . Restaurant in the margins of Lagoa da Conceição offering traditional dishes. Try the "Congrio Chileno à Moda do Chef". Most of the nightlife is concentrated around the beaches in the summer. During the winter, the night life is concentrated in Lagoa da Conceição, where most of the bars and clubs are located. Party Bus Brasil,  - A big yellow bus which take tourists to the best bars and clubs. Have a bar at one end and a DJ booth at the other complete with flashing lights and disco balls. Cachaçaria da Ilha, Avenida Osmar Cunha, 164 - Centro, tel. +55 48 3224 0051, . Customary meeting spot for tourists and local surfers. A pleasant spot for a drink with friends. Concorde Danceteria, Av. Rio Branco, 729 - Centro, . Nightclub with two floors, 3 bars, a rotating dance floor, and a room with free internet access. Caters to the gay community. Pacha, SC 402 - Rod. Maurício Sirotsky Sobrinho, Km 1 - Jurerê Internacional, tel. +55 48 3282-2054. Empório do Chopp, Rod. Admar Gonzaga, 3320 - Itacorubi, tel. +55 48 3232-8888. Heading towards Lagoa da Conceição from downtown, this drafthouse sits at the foot of the hill on the right. Four types of Eisenbahn draft. Floribar Café Lounge, Rua Durval Melchíades de Souza, 638, tel. +55 48 3322-2550, . Primarily gay and lesbian bar, good service. Ilha do Cascaes, in front of the Costão do Santinho Resort - Santinho, tel. +55 48 3261-1555 e +55 48 3224-1392, . John Bull Pub, Av. das Rendeiras, 1046 - Lagoa da Conceição. tel. +55 48 3232-8535, . Mix Café, Rua Menino Deus, 47. tel. +55 48 3324-0102, . 2-story night club with a bar downstairs and a dance floor, stage, dark-room, and bar upstair. On Fridays they hold a drag queen event. Scuna Bar, Avenida Beira Mar Norte, under Hercílio Luz bridge, tel. +55 48 3225-3138. Night club with 2 levels, 3 bars, dance floor, live music, and dedicated parking. Popular with the over-35 crowd. Sins Pub, Rua Tiradentes, 143. A nice gay/lesbian bar downtown, free entrance. Albergue da Juventude, Rua Duarte Schutel 227, +55 48 225-3781. Hostelling International hostel is located 10 minutes away from the bus terminal and close to the beach. Prices vary according to season. Backpackers Sharehouse, Servidão da Prainha,29 Barra da Lagoa (cross the footbridge). Tel. +55 48 3232-7606 . This is a popular backpackers spot. It serves an excellent breakfast and has budget meals. Guest can use the surfboards for free. Dorm beds R$35, includes breakfast and wi fi internet. Portuguese lessons are also available for those interested. Hotel Bruggemann, R. Santos Saraiva, 416 - Estreito, tel. +55 48 3224-2344. One of the oldest hotels in Florianopolis, Hotel Bruggeman comes with modernized amenities. Rooms are fully refurbished. Hotel Bruggeman is comprised of 84 apartments and suites, each equipped with a tv and refrigerator. Veleiros Hotel, R. Silva Jardim, 234 - Centro, tel. +55 48 3224-6622. This hotel is located close to the city center and the Convention center. Reservations must be received 15 days prior to arrival. Pousada Colinas da Lagoa, tel. +55 48 3232-5747. It is situated in the privileged area of Lagoa da Conceição, with a view of its Hill and close to the best beaches of Florianópolis. Pousada Bangalos da Mole, tel. +55 48 3232-0723. Beachfront to the beautiful Praia Mole, which is centrally located, since it is the closest beach to the Lagoa da Conceição town. Ibis Hotel, Av. Rio Branco, 37 - Centro, tel. +55 48 3216-0000 / fax +55 48 3216-0001, . Located 5 minutes from the bus station, Ibis Hotel has a 198 rooms with air-conditioning. There is a 24-hour bar, and a restaurant serving traditional cuisine on the premises. Parthenon Lindacap, R. Felipe Schmidt, 1.102 - Centro, tel. +55 48 3225-4500 / fax +55 48 3225-3645, . This 67-room hotel is located downtown, with easy access to shopping and restaurants. Each room includes air-conditioning, a mini bar, and in room safe. The hotel itself has a bar, restaurant, and fitness facilities. It also offers its guests spa services. Rates from R$110. Joaquina Beach Hotel,Estrada Geral da Joaquina, 2323 - Lagoa da Conceição,  This hotel offers no-frills rooms with AC, TV and telephones with a nice cafe for breakfast, lunch or coffee on the ground floor. Includes parking, and is 100m from the beach, which as close to "on the beach" as you can get at this beach. Perfect for surfers, and Mole Beach is a 5 min drive away. Maratea Mare Hotel  +55 48 3284-5495 sea front hotel. Located in a marvelous area on the Cachoeira do Bom Jesus sea front, Maratea Mare Hotel offers its visitors an unforgettable view. All the apartments are composed of a dormitory, a bathroom, a living room, a complete kitchen, air conditioning, telephone, TV and safe. Brasilian "colonial" breakfast and beach service included. Free internet WIFI Service for guests in lobby area. Rates from R$99,00 in low season. Pousada da Lagoinha  +55 48 3232-4757. It is a very cozy guesthouse, located in front of the Lagoinha beach in northern Florianopolis, with a local colonial design, for those who like a calm and peaceful place, surrounded by the Atlantic Rain Forest vegetation. Costão do Santinho, tel. 0800-48-1000. +55 48 3261 1000, . Very nice all-inclusive resort and spa. Very kid-friendly. It's a bit out of the way though, but it is serviced by the yellow bus lines, and it does provide rental car facilities. The beach (Santinho) is extremely clean and beautiful, but has zero nightlife. Nexus Surf, Tel. +1 (310) 256-4339 (from outside of Brazil) / +55 48 9626-9029 (from within Brazil),  located directly in front of Praia Mole beach, just minutes outside of the charming Lagoa downtown area. Offers unique vacation packages that include accommodations (wireless internet, international phoneline and air conditioning standard), rental car, surf lessons, adventure sports activities, guided nightlife access, local cell phone, and breakfast service. Majestic Palace, Av. Beira mar Norte, 2.746 - Centro, tel. +55 48 3231-8000 / +55 48 3224-6746, . Located on the main street of the city next to Shopping Beiramar, the Majestic Palace offers various services such as air-con with remote control, a coffee shop, fitness center, piano bar, restaurant, spa, breakfast service, concierge, heliport, swimming pool, 24h room service, business center, convention center, minibar, and broadband internet. Sofitel Florianópolis, Av. Rubens de Arruda Ramos, 2034 - Centro, tel. +55 48 3202-6100, fax +55 48 3202-6101, . Planned as a boutique hotel, there are 120 rooms, 2 suites, and one presidential suite. Pool, sauna, convention accommodations. Florianópolis Palace Hotel, R. Artista Bittencout, 14 - Centro, tel. +55 48 3224-9633 / fax +55 48 3223-0300, . In a good location near Praça XV and the Cathedral, this hotel has 21 presidential suites, 8 luxury suites, and 89 luxury apartments. Il Campanario Villagio Resort, Avenida Dos Buzios, 1760 - Jurerê, tel. +55 48 3202-6100, . The hotel is 60 ft. away from the beach. This page was last edited on 5 April 2019, at 19:38.